Experiencing the differences between my native Philadelphia, east-coast wintry world vs. the lovely and sunny Scottsdale, Arizona was the most rejuvenating wintertime art-viewing I’ve only imagined doing before. Scottsdale hosts a weekly Thursday evening ArtWalk similar to Philadelphia’s monthly First Friday. Galleries stay open late and many local restaurants, shops and nightlife participate in a vibrant, fun experience where gallery strolling introduces art to both new and “die-hard” aficionados. Rachel Bess, “Prisms”. Oil on panel, 10″ x 8″, 2013. Photo courtesy of Lisa Sette Gallery. 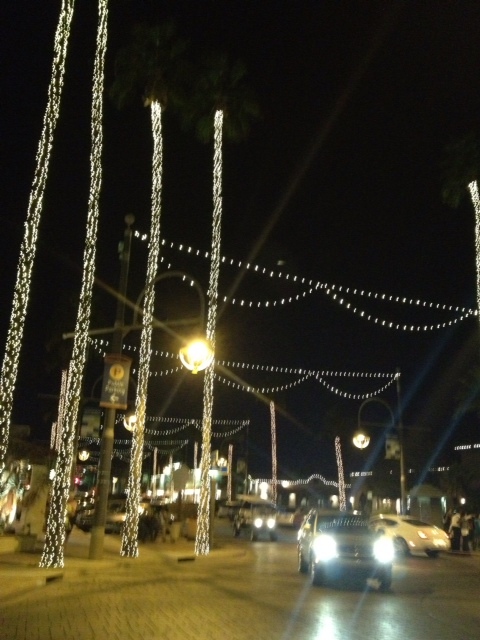 Strolling along Main Street and North Marshall Way, this area of the downtown is known locally as Old Town Scottsdale. Lisa Sette Gallery was exhibiting an extensive show of work by Arizona painter, Rachel Bess. Bess’ exhibition Light, Color, Darkness offers a breathtaking view of an artist’s genre of work that is as introspective as much as the scale of each piece is so exceptionally personal. Bess chooses to paint primarily in oil on panel – but at a scale that could be held in one’s hands or viewed almost like a talisman: many of her panels measure only 8 x 10 inches (20.5 x 26 cm) or smaller. Prisms depicts a young female clad in a beautiful off-white or sandy-white dress, in a three-quarter profile view, holding a reflective object (is it yellow glass?) while creating an aura of “prisms” surrounding her. 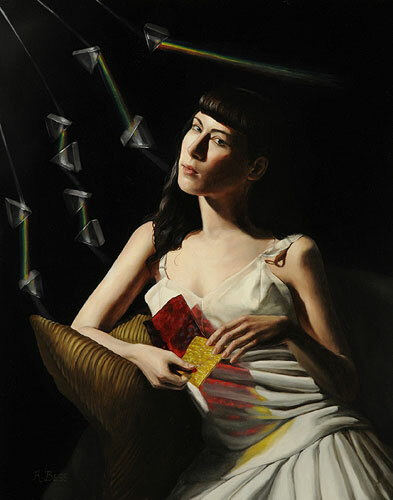 Shooting outward and behind the figure – the model seems confidently aware that these prisms are meandering and rolling outward – but she appears non-fussed by all of the prism energy surrounding her. Bess seems to pay homage to the masters of traditional oil painting, such as Jan Vermeer; however, there is an element that provokes one to describe this stunning work as Vermeer or Raphael meets “the new world of Goth” while jettisoning the history of the medieval painting masters into present times. 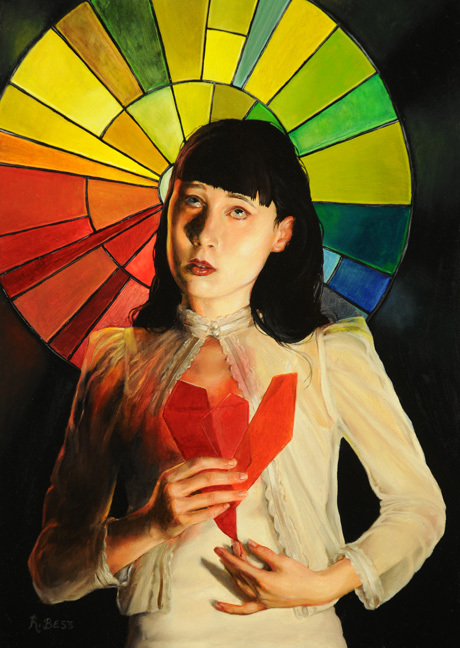 Rachel Bess, “Heart of Glass”. Oil on panel, 7″x 5″, 2013. Photo courtesy of Lisa Sette Gallery. Lisa Sette Gallery is located at 4142 North Marshall Way in Scottsdale. Note that just this week, however, Lisa Sette announced the gallery will be moving its operations into the midtown Phoenix area. Having recently posted to artdoesmatter about the fabulous art and mountain vistas of Phoenix, one can certainly understand the attraction. The gallery is hosting an opening tonight during the Scottsdale ArtWalk, from 7-9PM, Mountain Time Zone, U.S.A.; if you’re fortunate to be local to the Scottsdale area, I encourage you to drop by and see the work currently on display. The topics discussed and locations mentioned in this blog post are solely my own choice of adventures, and I receive no compensation for any endorsements. Gina, I appreciate your feedback!! Not being familiar w/ “The Bean Trees” – I just read a synopsis of the plot. What a colorful and imaginative series of fiction!! I’m so glad that you understand my notion of the ‘old masters meeting goth’. At one point – I thought, “Should I delete that thought?” But it truly was the initial impact that grabbed me once I walked into the gallery. It’s what attracts me to Rachel Bess’ body of work – how she so aptly combines the history of the “oil on panel” painting genre w/ the current fashion, mindset and style of present times – and/or possibly, her subjects. Thanks so much for stopping by tonight! Very intriguing paintings and your “take” on them is very interesting, Patricia, as always. Thanks for introducing me to this artist and gallery. The 8″ x 10″ piece is stunning and I can’t quite believe my eyes that “Heart of Glass” is only 7″ x 5″… WOW!! Glad you had a great trip out of Philly’s yucky weather. Anita, I’ve thought of you often during these rough wintery (and now hopefully!) past weeks. I wish you could have been standing w/ me in Scottsdale, looking at these paintings together. A good number of Rachel Bess’ oil works were on display – and there was more than just one 5×7 inch piece!! As you know, it’s not too often that I visit a locale as far from Philadelphia as Scottsdale – but to see a style of painting closely resembling some of the Philly realist painters (such as Pennsylvania Academy of Fine Arts alums) was way too fascinating for me to just gloss over. I knew I wanted to blog about the incredible work I’d seen of this artist. I hope all is well for you and that you are enjoying the launch of Spring as much as I will be. Thank you so much, Anita, for dropping in and sharing your lovely comments! Another treat for us Patricia. I LOVE this woman’s work and her artist’s statement. “yes, it really is all about the light in every aspect imaginable” I also love that these works are small. There is so much to them they would be diluted if they were bigger. Great synopsis, Sharon – yes, I agree – the artist seems to marry the perfect combination of depicting modern women (and men too in her other paintings) with a nod to the past. The viewer doesn’t “need” to have a complete background in art history to appreciate the wonderfulness of this work. I do agree w/ you that enlarging the scale of this particular body of work would dilute its magic – but I have seen other realist painters work on a very large, grandiose scale, and for them, that’s fine. But in the case of this exhibit – the work was so approachable and almost tempting to be handheld, though I would not dare! 😉 Thanks so much for stopping by today and for your always stimulating feedback!! Interesting to see these paintings Patricia and to hear your reactions. They are engaging works with the strangeness of a frozen moment. A South Australian painter, Anna Platten does some similar work. Many of them are life-size figures but they are similarly arresting! Google has her images. Not meaning to hijack your blog with that – It is great to hear more tales from your time in the sunshine! Thanks. Philippa, I love hearing your commentary – as I was unfamiliar w/ Anna Platten’s work till now. I can definitely a see similar vein to Bess’ pieces in that capturing of a “frozen moment”. Googling Platten’s work does show examples, but a review I found of her solo show several years back stated that private collectors snap up most of her paintings before they can even be catalogued or exhibited!! See, this is why I keep you around, Philippa 😉 Always adding yet more insightful and valuable info to my blog! Thanks so much for stopping by today. Great post, Patricia! Rachel Bess is a consummate painter, an expert at capturing the play of light on various surfaces. Her paintings are intriguing, edgy and delicate at the same time; she’s managed to achieve a perfect balance. That she chose such a small scale for her work was very puzzling to me, but your analysis made sense of it all by pointing out that it could also be viewed (“almost like a talisman”). Thank you for your insight. I enjoyed traveling to Arizona, vicariously, through your last posts, Patricia. I can’t wait for your next trip! Dominique, your wonderful comments could not have come at a better time – as I’m sitting at my jewelry bench, doing one of the messiest (and dull) tasks of my work (grinding Plexiglas for one of my new pieces). I was so happy to read your feedback regarding Rachel Bess’ work! A perfect synopsis – and if I may borrow this phrase you’ve written here, seeing her paintings in-person only reinforces the notion that truly she is a consummate painter. Thanks so very much for visiting my blog today and sharing your always-inspiring commentary! I love reading about “my” towns…Phoenix and Scottsdale, seen through the eyes of someone who doesn’t live here. I’m glad you liked it so much, it’s pretty lovely, I think, after almost 40 years of living here. You should come back and experience downtown Phoenix’s First Fridays (if you didn’t). Candace, we loved the Phoenix area so much that it’s pretty guaranteed that we’ll be back. The high level of artistic excellence I saw in all the galleries (and Mesa Contemporary Arts Museum esp.) really impressed me. We didn’t have a chance to see Phoenix’s First Friday, as my opening in Mesa was that Fri. night we were there – so that’ll be one of my top priorities next time! Thanks so much for stopping by and sharing such thoughtful comments.